Leading Them To The Rock : I want to Homeschool in Indiana... Where do I start? 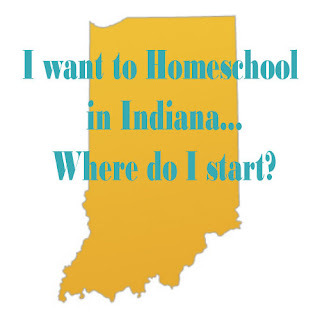 I want to Homeschool in Indiana... Where do I start? How To Start Homeschooling in Indiana. Many are surprised by how much homeschooling law varies from state to state. I live in Indiana, and we are blessed to have homeschool friendly laws. That said, it can be overwhelming to bring a child home from public school, or to start the journey of homeschool. You must have 180 days in your homeschool year. Indiana has no stipulations on what a "day" looks like in your house, or how many hours it is; which means Indiana can not mandate your curriculum choices, pace, or yearly schedule. Your child does not need to participate in any standardized testing. As a homeschooling, your child can't take the ISTEP. If you really feel like you'd like to have your child take testing, you may pay for your child to take Bob Jones Accredited Test. Are you transferring your child from public school to homeschool? Instead of the word WITHDRAW, I would recommend the word TRANSFER, Indiana Homeschools are considered non-accredited, nonpublic schools, which is why (IAHE) recommends using the term "transfer" instead of "withdraw" when informing school. Become a member of HSLDA if your district gives you any problem. Even though we are a very free Homeschool State, it doesn't mean every district/principal/superintendent is homeschool friendly. Sometimes district are just ignorant of the homeschooling laws of the state. Are you homeschooling from the beginning? You DO NOT need to register with the state Department of Education (even though the DOE's website strongly implies this). Parents may choose to register, but this is your family's decision. We personally have never registered our children with the DOE in 5 years of homeschooling. If you do choose to register with the state, the Age of Compulsory attendance is not until 7 years old. This step will help you with all the rest. I can point you in the first direction, but your local homeschooling can give you info on local field trips, play-dates, curriculum choices, dealing with unsupportive in-laws, and finding resources in your area. Check your local YMCA, Library, and/or local Parks and Recreation for Homeschool-geared activities. The homeschool community has grown in the past 20 years, which includes communities who have begun to offer resources and activities during the school weekday. A Co-Op is just short for Cooperative. Not all homeschoolers enjoy co-ops, they are just another resource if you choose to use them. It is only a true cooperative if the parents all have a job, helping teach or assist in some way. Co-Ops are all different, because they are what the Moms make of them. Some meet weekly, some monthly, some just for field trips. A Co-op can be big with dozens of families, or just you and one other family. See more on my post- What is a Homeschool Co-Op? The beauty of homescholing in Indiana is you can have find the prefect fit of curriculum and routine for your child. I suggest that before you begin your curriculum search, look at different home school styles. This will take hours off your curriculum search. Not many people are entirely one style, but you lean towards certain styles based on your own personality. See 5 of the most common homeschool styles here- Five Homeschool Styles. We personally tend toward Unit studies, with some philosophy of Charlotte Mason. We are in a golden age off curriculum choices, but that can also be extremely overwhelming. Seek help from friends and great reviews for Secular and Christian curriculum from Cathy Duffy Reviews. While there several options of styles, most curriculum fits into a few different types based on your family needs. Boxed curriculum come with a teacher's Manual, and all the books you need for teaching your child. No hours of planning or seeking out books, just open the manual and teach each day from the books provided in your box. You can go at your own pace, but the template of the teacher's manual is extremely helpful. I am heading into my 5th year, and still love my "open and go" curriculum, My Father's World. Also See this post for my 4 "Open and Go" Home-school Curriculum. Many moms piece together their curriculum from different publishers, and use a homeschool planner to plan their day. The increase in homeschooling families equals more resources available, meaning you can pick the curriculum that best meets the needs your family and child. K-12 is a free online schooling option. Please note this option is not technically homeschool, it is public school at home, meaning you have no authority over your content , pace at which you cover the materials, or school schedule. That said, it is an option that has helped many families! This is a good option for the mom who wants their child to stay lock-step with the public schools. This could be for someone who knows for sure homeschool is just a season, and their child will be going back into public school eventually. I have 5 year (K) old and 7 year old (2nd grade) who are currently at private Christian school. Next fall we will be homeschooling using MFW, do I still need to provide written letter of intent? The school may assume them truant if they do not show up in the fall.